It's Facebook Fridays! for January 22, 2016! The doors of perception are opening! Beyond this mundane realm are vast vistas of supernal interconnectivity -- the sphere of the psychic! The cosmos of clairvoyance! The world of the wyrd! The unseen universe, coming slowly into focus! The Lucky Mojo Curio Company is holding a random drawing to give away 2 amazing Psychic Vision spiritual supply prizes that enhance and expand your latent preternatural powers. 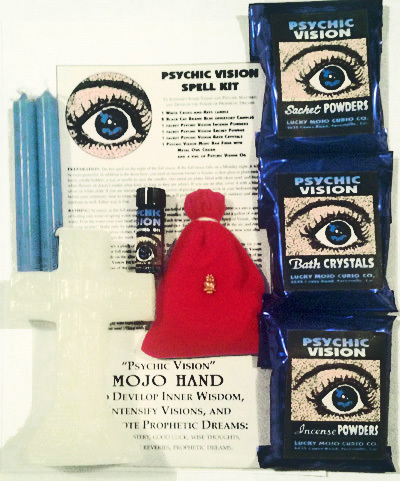 This week 1 lucky winner will receive a hand-made Lucky Mojo brand Psychic Vision Spell Kit, complete with all ingredients and instructions for use; and a second winner will get 1 bottle of Psychic Vision Anointing Oil. 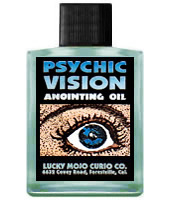 First thing tomorrow morning, we will select TWO winners at random, announce their names here, and ask them to message this Facebook Page with their mailing addresses, so we can send them their FREE Psychic Vision products. We have a winner! In fact, we have 2 lucky winners! Our Facebook Fridays! winners for January 22, 016 are: Teresa Buckiewicz, and Denise Lowery.